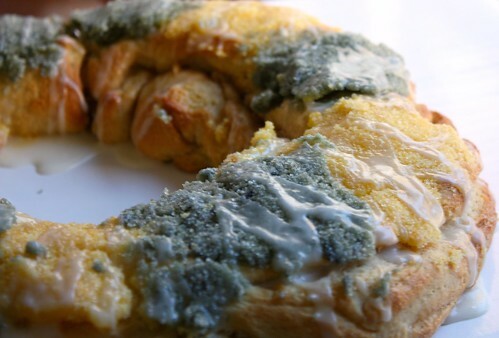 I’ve made king cake before, and it turned out tasting like bread. It was NOT king cake. This recipe, however, is MUCH better. This recipe actually comes from Haydel’s Bakery, which is where we had our wedding cake and groom’s cake (which was a tiered king cake) made. I found it fairly easy to make too, however, I think their recipe would be much better if you ice and sugar after baking, which is different than what their recipe suggested. When I made it their way (bake with sugar already sprinkled on), most of us just pulled the chunks of sugar off of the king cake while eating it. In a mixer at first speed combine 1/3 cup granulated sugar, salt, and shortening until well creamed. Add eggs and continue to cream. Dissolve the yeast in the milk and add the flavors. Once dissolved add to creamed mixture and continue to mix. Add flour a cup at a time and mix until dough tightens. Remove from mixer and knead into a ball. At this point sprinkle some flour on top and cover with a clean kitchen towel. Allow the dough to rest for 1½ hours. While the dough is resting mix your colored sugars and icing. Mix the 1/2 cup of sugar with a few drops of food coloring until the color you reach is desired. For the icing, whisk the confectioners sugar with the water and vanilla. When dough has rested roll out into an oblong piece. Brush on canola oil covering the entire piece. Sprinkle the cinnamon sugar liberally over the whole piece. Once the dough is covered with the cinnamon sugar and oil, fold it in half lengthwise. Cut into 3 strips and braid the dough. Gently roll the dough by starting at one end and working all the way down to the other end. This will make the dough a nice long piece that can then be shaped into a circle. Once shaped place on a baking pan covered with piece of parchment. Allow the dough to rest again until it doubles in size. Bake at 370 degrees F for 12-15 minutes until dough is golden brown. Let the cake cool and spread the icing on top. Then, sprinkle with your colored sugars. Enjoy! Yum! I love king cake. There was always a certain place in Mobile that we would order them from back when I lived there. Last year, Eric actually ordered one and had it shipped up here for Mardi Gras. Most of his coworkers had no idea what it was, so it was fun to explain the tradition to them (and, of course, they loved the baby, haha). mmmm king’s cake. i haven’t had king’s cake in years. looks delicious! I’ve never had king cake before, sounds so good! Mmmm love king cake! I woulllld like to have a fresh one though, since the only ones I’ve ever had were shipped in..so I imagine they would taste better if not a day old!!! !